diagonal crisscross pattern, being careful not to cut the skin. few good grinding of black pepper. for 30-45 minutes or until completely soft and nicely browned. yogurt, extra virgin olive oil, garlic, cumin, salt and pepper. Taste and adjust seasoning. Keep this in the fridge until ready to use. serve this on the side. and buy some eggplant based solely on that photo? Me being me, I went and I did. could whiz them in a food processor and make a very delicious spread. something that our hearts tell us is beautiful. Until my next museum trip, cookbook photos will have to do. That is a scrumptious combination! This sounds delicious and I love the pictures. oh heaven, love the yogurt on eggplant. Oh yes please! I love the sound of this! I didn't know you lived in amsterdam for a couple of months! Had we 'known' eachother then we could have met!! I'm not really a museum person though but your eggplant dish does it for me! Delicious ! Hi Spiky! It's a combination I really love! Hi Shalum! It sure is! Hi Kalyn! It is so simple yet so good! The inspiration is wonderful but I have to admit, your version had me craving more. Well, the photo and the magic word yogurt. Love, love, love museums, too. We even go to small town museums… you'll always get surprised there's so much history plus seeing their local talent. 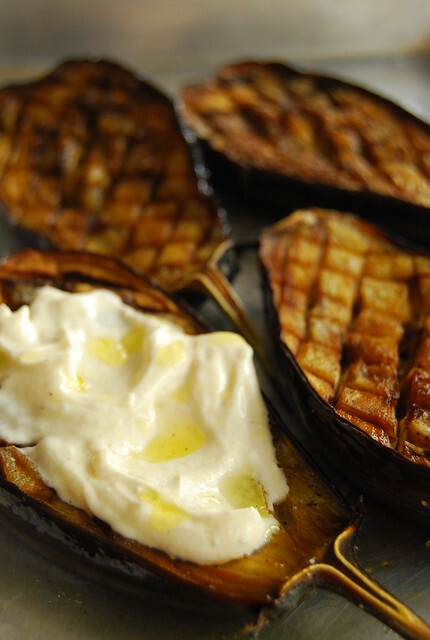 And your roasted eggplant… YUM! Hi Iska! Wonderful surprises in museums, I agree! How uncanny. I have Yotam Ottolenghi's 2 cookbooks on hold at the library. my husband and son turned vegetarians recently so i'm always looking for new recipes to try. I recently borrowed Ferran Adria's The Family Meal cookbook and Mourad's New Morrocan. Yes, I love cooking and cookbooks! And I have tried several recipes from your blog. Ate this tonight in pitas- and it was delicious! Inside the pitas, we put the yogurt sauce and some homemade hummus. Then, we added some lettuce-tomato-chickpea-artichoke hearts salad (tossed with just a little pepper, artichoke juice, and lemon zest). Put in some of the eggplant, and topped with more salad. Perfect dinner for two. Dessert was just some fresh fruit, but hardly had room for it. Very filling dinner. Thank you so much for this recipe!